You can take advantage of sale prices on hot dogs by buying them in quantity and freezing them. This is a guide about freezing hot dogs. 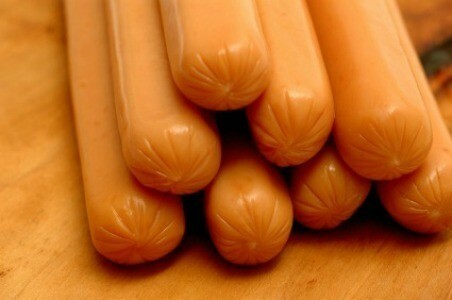 When buying hot dogs, open the package put all the wieners on a cookie sheet, then freeze them. Once they are frozen put them in a freezer bag. Then when you want one or two, they will already be separated. Can you refreeze hot dogs? It depends on how long they've already been thawed. If it was only a day or two and they were thawed in the refrigerator it would be safe but I don't know what it would do to the flavor. I have always heard to never refreeze thawed food. You can cook them then refreeze. Meat that has been thawed in the refrigerator can be safely refrozen within a couple of days. Can I freeze frankfurters in the packaging they come in? Or, will the packaging split? Ice expands so, depending upon what the frankfurters are made of, they might expand enough to split the packaging. I would use freezer bags to avoid the problem. I have frozen them in the package with no problem. I like to separate them into 4 wieners and freeze together so I don't have to thaw a whole package. Can you refreeze deer hot dogs that were defrosted outside of the refrigator for a day? No. Only refreeze meat which still has ice crystals in it. I never, personally, refreeze meat of any kind. Can I refreeze hot dogs which have been defrosted by soaking in hot water? As far as safety, I'd say it depends on how long they sat in the hot water and how much bacteria collected in that time. If it were me, I'd only risk it if they were defrosted for less than an hour, and they probably won't taste the same anyway. They may have freezer burn after refreezing.